Here’s the lettered preview for next week’s Daredevil #26! Are you as excited as I am? 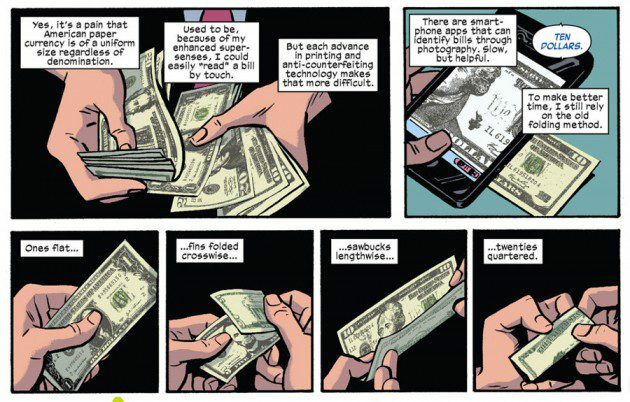 In Daredevil #22, we saw Matt demonstrate a cool smart phone app for identifying money. Ever since, I’ve had an idea in the back of my mind to expand on that topic and see what other apps he might find useful. 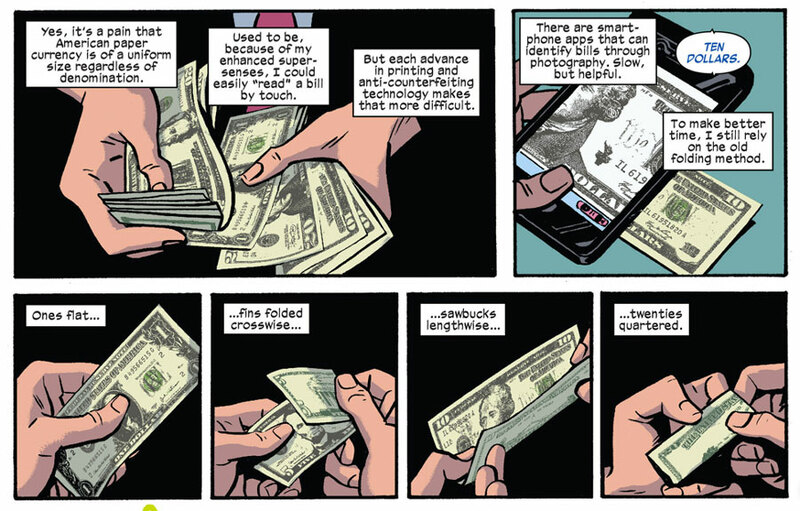 And yes, that money identification app has a real world counterpart, which we’ll get to below. It wasn’t that long ago that the idea of blind people using smart phones seemed like a pipe dream. Smart phones, as we know, rely on the user being able to visually identify objects on a screen and then interact with these objects by touch. Obviously, this is hard to do if you can’t see what your touching (and as far as Daredevil is concerned, this is one of those areas where his heightened senses are pretty useless). The iPhone 3GS and the mobile version of Apple’s built-in screenreader VoiceOver turned out to be a real game-changer, however. Since then, other operating systems and manufacturers have followed suit, and now it’s not just a matter of blind people being able to use a smart phone for its intended purpose, but of new technology being used to solve old dilemmas. What follows below are some real world examples of apps that I think Matt might find useful. The list does not include apps that magnify objects for people with low vision (what would be the point? ), and I’ve also skipped things like apps which detect light sources since his heightened senses have him covered in that regard. The real-life app for identifying that unseen pile of cash is the LookTel Money Reader, which quickly identifies different denominations of U.S. dollars, British pounds, and Euros. It works even when only a part of the bill is in focus. Read more about it by following the link above (and see the accompanying YouTube video). Even before Mark Waid decided to declare Matt’s print-reading-by-touch abilities virtually obsolete in the world of modern printing technology, the character must have found himself in many situations (between issues and panels) where a heightened sense of touch wouldn’t be enough to save the day. 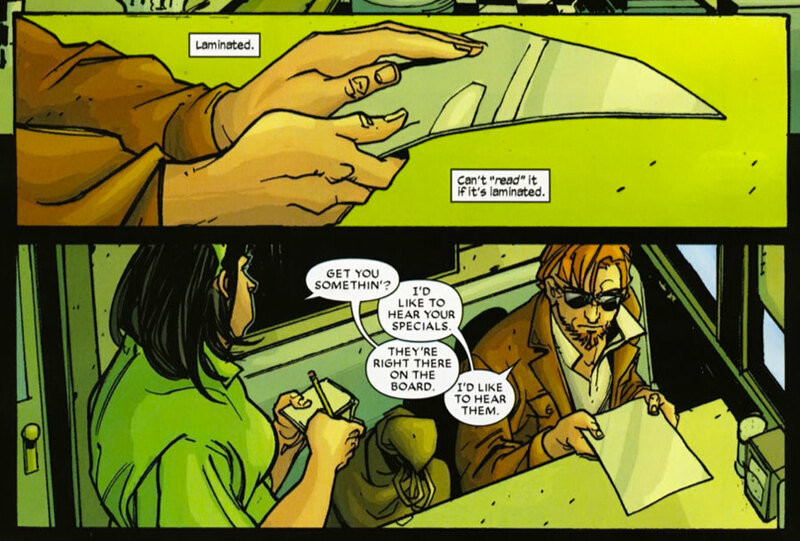 You have laminated menus (as seen in Andy Diggle’s and Davide Gianfelice’s Daredevil: Reborn #1, incidentally), signs and displays that are out of reach, and things you don’t want to leave your fingerprints on while Daredeviling around town etc. Lucklily, with a smart phone, many of those scenarios can be covered with one of several available apps that recognize text through OCR technology. One such example is Text Detective. It does have its weaknesses, but would nevertheless be a handy tool. Daredevil is trying to stack the cards in his favor by taking the fight with Ikari inside. He thinks to himself, “I recall this being a sporting goods store. 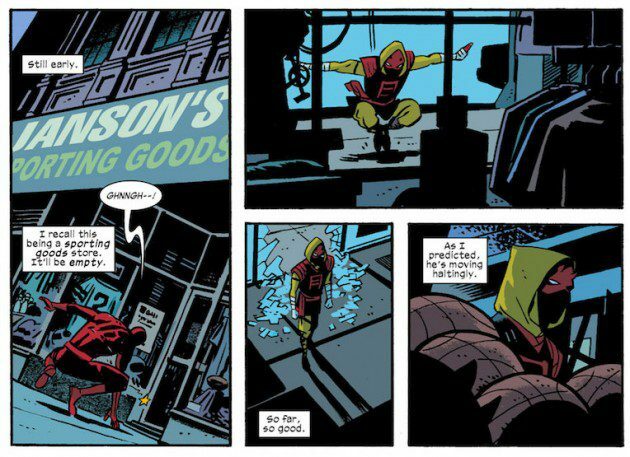 It’ll be empty.” The reader will see that Daredevil is correct (and a nice little Easter egg it is), but it also serves to highlight the fact that the only way Matt would know this is by remembering an old piece of information. He can’t read what’s written above the entrance, and the items inside (to the extent that he can perceive them through the glass) are a jumble of shapes. I fully expect Matt to have many parts of Manhattan memorized in great detail. Because the fact of the matter is that he really can’t rely on his heightened senses alone to identify many of the places that would remain anonymous to anyone who is literally blind to signage, branding and symbols, even if said person can clearly detect the building itself. Some places have distinctive scents (Starbucks), shapes (McDonald’s) or sounds (subway stations), but many don’t. If Matt finds himself trying to find an address or specific location outside of an area he knows well, he can’t be certain that his heightened senses will suffice. Add to this the “fact” (well more of a notion that I actually think is supported well by the record that is the Daredevil archives) that his radar sense doesn’t have a very long range compared to normal vision. Things close to him will appear to have more definition than things that are farther away. He can’t simply gaze down the street and spot something two or three blocks away. Digit-Eyes is a bar code scanner app that not only identifies which item a particular bar code is attached to but the cost of the item, nutrition info and ingredients (in the case of food) and other information that may be printed on the can or box (such as cooking or other instructions). So, there are tons of nifty apps. But what about the problem that it keeps your ears occupied? True, Matt’s supersharp ears can probably hear most of what’s going on in the background anyway (and decide what’s important! ), but in the event that he’s worried about missing anything while listening to Foggy’s latest email or something, there’s an app called Awareness that is set to feed sounds louder than the ambient noise lever directly through the earphones. This one is useful for sighted people as well. That was just a short list. I should also add that there are several apps for things like color identification as well, but these may not be very reliable. Determining color is really much more complicated than one might think. The human eye excels at it, ably assisted by the human brain, allowing us to experience objects as the same color across a wide range of different lighting conditions, but it usually takes pretty expensive equipment to duplicate this natural ability with high quality. Daredevil #1 preview – colored and lettered! I can just see somebody freaking out when they accidentally shake the phone and it spouts their address. And maybe Matt finding them that way and beating them up. Don’t forget the BrailleTouch app shown in the current issue. Greate app for Braille users to text and write.